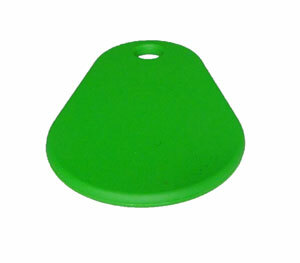 A green 45mm x 30mm x 2.2mm keyfob containing a MIFARE DESFire EV1 4K chip. This extremely durable, 100% waterproof thin keyfob is designed to be attached directly to a keyring. A useful alternative for contactless systems, it operates at 13.56 MHz wireless frequency, according to the ISO 14443A standard with the transport protocol complying to the ISO 14443-4 standard. The MIFARE DESFire EV1 4K keyfob contains 4K bytes of non-volatile memory, a high speed triple-DES data encryption co-processor, a flexible memory organization structure, a mutual 3-pass authentication technique together with a true random number generator and an anti-tear mechanism to guarantee data integrity during contactless transactions. MIFARE DESFire keyfobs typically operate at a distance of up to 10cm depending on the power provided by the reader. This keyfob is NFC forum type 4 compliant. A picture of the MIFARE DESFire EV 4k thin keyfob is shown below.